The Icom IC-F5011 | IC-F6011 is a great choice for businesses needing an affordable mobile radio with all the basic functions. This radio's design is focused on simplicity and aimed at users seeking easy operation. It comes with 8 channels, easily identified on a simple channel indicator. This radio is ideal for use in small to mid-sized fleets used for public safety operations, school buses, taxi fleets, large industries, and other light commercial users. The IC-F5011 | IC-F6011 is built to last. 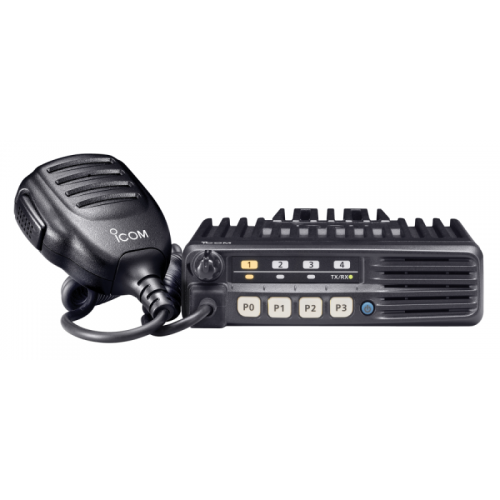 Icom's rugged construction and design make the IC-F5011 | IC-F6011 ideal for day-to-day use. The radio has been tested to military standards MIL-STD 810 F for ruggedness in harsh locations. It has a front mounted 4 watt speaker to deliver clear loud audio. There are 4 programmable buttons for you to customize functions to meet your particular needs. The IC-F5011/F6011 has the most commonly used signaling functions built-in. Ten 2-tone, and eight 5-tone codes can be decoded on each channel. When a matched tone is received, the following items are programmable for each code: • Beep sound • Answer back • Scan • Bell icon • Radio Stun / Kill / Revive. The radio stun/kill function incapacitates a stolen radio over the air, eliminating security threats from undesired listeners. When the stun command is received, all the functions will be temporarily locked out until the revive command is received or the unlock password is entered. The IC-F5011 | IC-F6011 can be used in existing MDC fleets, and has the following MDC signaling features: • PTT ID (TX/RX) • Radio check (RX) • Radio stun (RX) • Radio revive (RX) • Emergency TX/RX (No ACK) • 5 alias table. The IC-F5011 | IC-F6011 also has CTCSS/DTCS high speed decode for better performance and 2-Tone decode accuracy. In addition, it has up to 8 DTMF autodial memories. TheIC-F5011 | IC-F6011 has several enhanced scan features. The priority scan function allows you to monitor one or two priority channels, while scanning other non-priority channels. The TX channel and Talk Back functions allow you to make a quick response while scanning. When in Mode Dependent Scan, scan setting is dependent on the operating channel. When you change the operating channel, the scan list automatically changes to the list set for that channel. This allows you to move seamlessly to a different operating area, and scan settings will automatically be adjusted. The TX channel setting allows you to program a transmit channel while scanning. Start channel, last detected channel, priority and pre-programmed channel are all selectable. The IC-F5011 | IC-F6011 can be upgraded to add either a voice scrambler, or DTMF decoder option boards. Like this radio but need a display or a little more function? Check out the Icom IC-F5021 / IC-F6021 series. It has all the same features plus a display, 6 programmable buttons, and more features. ¹ Limited MDC 1200 function. The specific frequencies you use in the radio must fall within the antenna's frequency range. You will need an antenna mount with a PL259 connector to attach the antenna to this radio. If the mounting surface is NOT metal you will need a "No Ground Plane" antenna. Metal surfaces can use either type. "Accessories > Antennas | Mobile" category has other name-brand antennas and mounts, including no ground plane antennas.